180 Medical is a national leader in the intermittent catheter and related urological supply industry. We recruit employees who are hardworking individuals that want to enjoy going to work. We offer a very competitive benefits package, extensive training and fun extras. 180 Medical has recently been named a Best Place to Work in Oklahoma for the fourth year. We offer a variety of positions in different departments and opportunities for growth and development within our company. Today, we’d like you to meet Cathy, our Louisiana Office Coordinator! Cathy, how long have you worked for 180 Medical? What are your typical job duties as an Office Coordinator for 180 Medical? I am responsible for maintaining the Louisiana office in accordance with accreditation standards and am the local representative for insurance audits. I also work with customers who come in to ensure they get the supplies they need. In addition, I work very closely with our sales reps in the field keeping them up-to-date on customer updates and ensuring they have all the information and supplies needed to be successful in the field. Once I am able to determine the type of insurance the customer has, I am able to determine the next step to ensure they get the supplies they need. What is your favorite thing about 180 Medical? 180 Medical values their employees. Other companies I’ve worked for only had an annual employee appreciation day. Not here! 180 Medical has quarterly meetings where they show employee appreciation with giveaways, awards, recognition, and games. It’s pretty amazing the effort that goes into making 180 Medical a great place to work. Why do you like working for 180 Medical? I like helping people, whether it’s customers or my coworkers, and working for 180 Medical fulfills that desire. I also value the relationships I have with my co-workers. 180 Medical co-workers are more than co-workers – they are friends that care about each other. What sets 180 Medical apart from other employers? The casual dress code! I’ve never worn shorts to work before, and it took me 2 years before I felt comfortable, but I finally did it. What’s a favorite memory at 180 Medical? That has to be my very first customer to the local Louisiana office. The gentleman lives about 30 miles out of town. He came to town one day to visit family, and he normally purchased his catheters from a local provider when he was in town, paying cash for them. He would wash and reuse the supplies until he could afford to come back to town to purchase more. The provider went out of business and since he was in town already, he decided to stop by to see if we could help. I was able to work with him and his physicians’ office to get his supplies delivered to his door each and every month. He no longer has to make the trip to town for his supplies. Best yet, we were able to bill his insurance saving him time and money. That experience showed me that what we do really does make a difference. He was so grateful. Tell us a little bit about yourself outside of work. I’ve worked in administrative support in the medical field for more than 20 years. Away from the office, I love to spend time with family – especially my grandkids and my two dachshunds, Roxie and Oscar. I like to garden, read and travel with my husband discovering new places. I love watching the sunrise on the deck of a mountain cabin or on a cruise ship with a good cup of coffee. One day, I’d like to travel up the East Coast to visit the lighthouses. Trish Eklund has worked as an Office Coordinator for 180 Medical for 8 years. When she is not at work, she enjoys writing, photography, reading, and spending time with her family. Interested in a career at 180 Medical? Check out our recent spotlight on the Shipping Specialist position. Our employee spotlight this month is on Megan, a corporate recruiter for 180 Medical. Looking for a rewarding place to work where you can make a difference? 180 Medical is hiring! 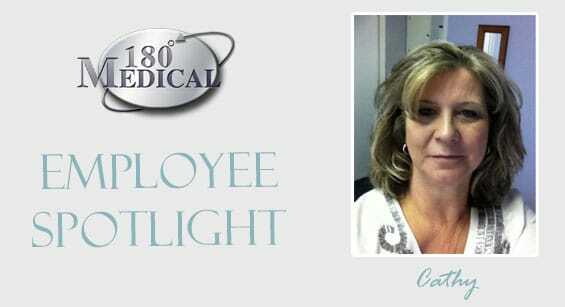 Learn more about our employee Summer and her job position as a Verifications Specialist at 180 Medical.